ORION, Bataan — The municipal government here on Wednesday placed the town under a state of calamity following a huge fire incident that gutted more than 900 houses, affecting more than a thousand families. “Nagdeklara kami ng state of calamity para matutukan ang pangangailangan ng affected families (We declared state of calamity so that we can give focus to the needs of the affected families),” Mayor Antonio Raymundo said. He confirmed that one person died from the fire that started about 9:50 a.m. and was put off around 1 p.m. on Tuesday. The fire affected 1,018 families of 6,131 individuals. The fatality was identified as Rey Suson, 45, a fisherman. His charred body was discovered Wednesday morning inside his burnt house in the middle of Sitio Depensa, a fishing area in Barangay Capunitan of this town. “Kinukuha niya mga gamit sa bahay. Bumalik siya dahil naiwan niya pera pero pagbalik niya, na-trap siya ng sunog. Mabilis ang apoy (He was getting things from the house. He went back to get the money he left but got trapped when the fire spread rapidly),” said Jaime Dungod, chief barangay tanod of Capunitan, said. The affected families were evacuated to the Capunitan Elementary School where they were served food and given some clothes. “Mabilis ang apoy. Nasa gitna ang bahay namin. Takbuhan kami (The fire grew so fast. Our house was in the middle. We ran),” said Belinda Ochea who was among the evacuees. They have been staying in Sitio Depensa for more than 20 years, she said. Raymundo said most of the affected families were natives of Cebu and Masbate, with fishing as their main livelihood. The mayor said they will be temporarily transferred to a tent community and no longer allowed to rebuild houses in Depensa. He said they were preparing a sort of tent city for the affected families. “While the National Housing Authority is fixing the 1,000 houses, the easiest way for the evacuees to settle down is to stay in tents. After, they will be relocated to Barangay Daan Pari in Orion. Their livelihood will not be affected because they will be near the coastal (area),” Raymundo said. He said he asked the Provincial Environment and Natural Resources Officer to assess the more than three-hectare area where the houses were built. “This will be included in the Manila Bay coastal cleanup,” he noted. Ochea and Dungod said they were willing to be relocated as long as the area is near the sea. Reports showed that the fire started when two children, aged 3 and 4 years old and left by their mother, played with matches. He noted that most of the houses in the area stored gasoline for their fishing boats. 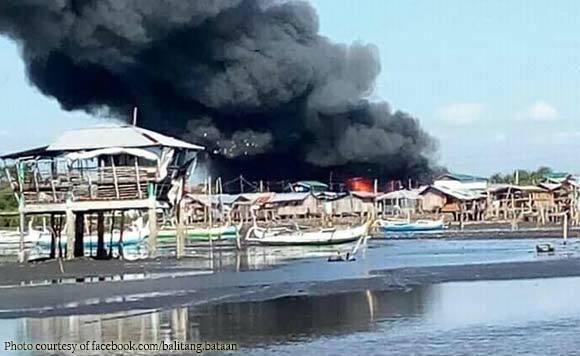 The burnt houses were mostly made of bamboos and some out of concrete connected by bamboo bridges along the river banks and shoreline, Capunitan village head Ernesto de Luna said.